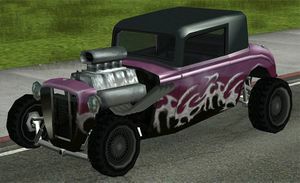 A Hotknife in GTA San Andreas (Rear quarter view, with covered engine, PS2 rendition, with covered engine).. The Hotknife is a custom car appearing in Grand Theft Auto: San Andreas and Grand Theft Auto V. In GTA V the vehicle is only available with the Collector's Edition of the game. The Hotknife is a late 1920's or early 1930's Hot Rod resembling a Ford Model A (it closely resembles the 1928 version of the model) with modifications and a custom paint job. The car comes only in one paint scheme; purple with white vinyls and black roof; visits at Pay 'n' Spray garages have no effect on the car; neither can the car be modified at any modification garages), but features two variants; one with a covering on the V8 engine and one without a covering. It has capacity for only two people. In GTA V the Hotknife continues to resemble a 1930's hotrod, as stated by Rockstar themselves. This vehicle is found only in the Collector's Edition of GTA V.
A Hotknife seen in a promotional poster for GTA V.
The Hotknife handles well on-road and off-road. There's great acceleration to be had from the V8 up front, but its top speed is ultimately lower than the more aerodynamic cars found in the game. One noteable thing about this car is its poor endurance in crashes, probably because of the exposed front suspension and radiator. Spawns in front of the Driving School in Doherty, San Fierro after getting all gold medals in driving school (its license plate reads "GOLD"). The only way it can regularly spawn in the streets is to activate either the "Clown Theme" cheat or the "Sports Car Traffic" cheat. Can be obtained through Vigilante missions, which in rare occasions are driven by criminals, but only at levels 1 and 2, otherwise only 4-door cars are used (This can be done even from the beginning of the game). Can be found on The Strip on extremely rare occasions. Players looking for an easier way to obtain the Hotknife can modify the cargrp.dat file to add the Hotknife (internally named "hotknife") to any car groupings. It may now spawn depending on which car group the Hotknife was added to. The default radio station of the Hotknife is Playback FM. It is one of the vehicles that can't be modded at any mod shops. Unusually, the upper frame of the passenger side's door is inconsistent to that of the driver side, appearing recessed and colored purple (as opposed to the driver side's black). If the player uses a lot of cheats (they don't have to be vehicle related) it will spawn more in the streets and if the player uses too much cheats it spawns more than most vehicles. This page was last modified on 5 February 2015, at 01:23.